The discussion that swirls over the future of global oil supplies often seems to focus, from the side of those who suggest that there is no problem, on the large volumes of oil that still remain in place around the world. The critical point however is not that this oil exists, but rather the rate at which it can be recovered. This is perhaps most obviously pertinent to the discussion of the oil coming from the Bakken formation in North Dakota, where the rapid decline in individual well performance means that a great many wells must be developed and remain on line in the out years to sustain any significant flow past peak. It is a point that clearly was missed by Leonardo Maugeri, as I noted last week, and equally by George Monbiot, who has now finally been swayed to the side of the cornucopians, after years of doubt. But the issue of individual well flow rates are an increasingly critical factor when future oil production in oilfields around the world are considered and this holds equally true when the fields in Saudi Arabia are discussed. The history of oil production from Saudi Arabia has largely come from individual wells that produced in the thousands of barrels a day. In order to sustain that production over decades it has been necessary to ensure that the pressure differential between the well and the rock are sustained; that the rock has an adequate permeability to ensure that flow continues at a steady state; that the oil itself is of relatively low viscocity and is thus able to easily flow through the rock; and that there is a sufficient thickness and extent in the reservoir to allow such sustained production. All of those factors came together in the giant fields that provided high levels of production over many decades, most particularly in the northern segments of Ghawar. Yet those conditions are less commonly congruent in the fields that Aramco must now move into to address the coming falls in production from the historic sources. These “best of the rest” (as the late Matt Simmons called them) that must now increasingly carry the burden of sustaining Saudi production fail, individually, on differing grounds from meeting those earlier parameters, but collectively, and in the face of Ghawar’s decline, they will only be able to sustain production to their original targets and will not be able to provide replacement production as the oldest and larger begin to fade. I would remind you of the curve that Euan put up back in 2007 . But, in regard to the longer term question of total flow, will KSA increase their production to the 12 mbd that appears as some magic figure in the tables of the cornucopians as they look toward the end of the decade? I think not. Euan’s plot, if perhaps a little pessimistic over the rate at which Ghawar is declining is nevertheless true from an overall perspective of the changes that we can anticipate. Bear in mind that Aramco was only then moving to increase the size of their drilling fleet from historic levels of around 20 rigs to as many as 200 in the years since. And it is that change, with the underlying realities that it implies, that must be recognized when looking into the future. As the largest fields are depleted, so production moves from them to smaller fields in the region. And as those fields are depleted production moves to yet smaller, and initially relatively uneconomic fields, that now have value. But to achieve the same production a greater number of wells must be drilled, as their individual production levels and operational lives are now shorter. The Kingdom has been building production in a number of different regions over the past ten years. These have added considerably to overall Saudi capacity, but even if they are being drawn down at only 2% p.a. (as has been claimed in the past) that slow reduction makes it more difficult for them to be the source of additional production to meet any future increase in demand/replacement of depleted reserves. As I list the fields remember that when Ghawar‘s decline becomes evident these fields are already in production, and so it must be the smaller fields that lie beneath them in the hierarchy that will then have to carry the burden. 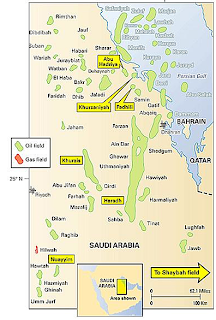 Qatif has been producing 500 kbd since 2004, from a field that started with a projected 6.2 x 31 mile size, with 151 development wells, and an 8.4 billion barrel reserve. Both it and Abu Sa’fah lie near Abqaiq and Berri. 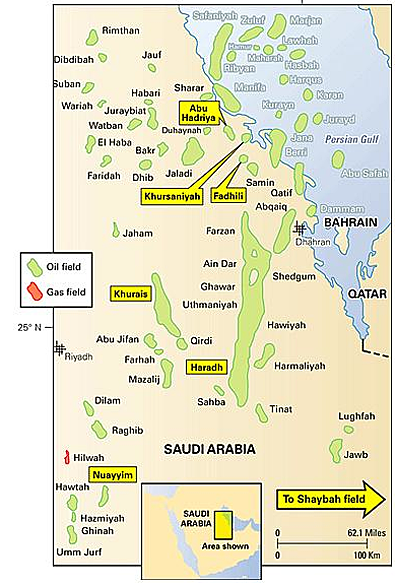 Abu Sa’fah, which was expanded at the same time as Qatif, to 300 kbd is an offshore field that covers 6.2 by 11 miles and in the expansion had 90 wells and reserves of 6.1 billion barrels. 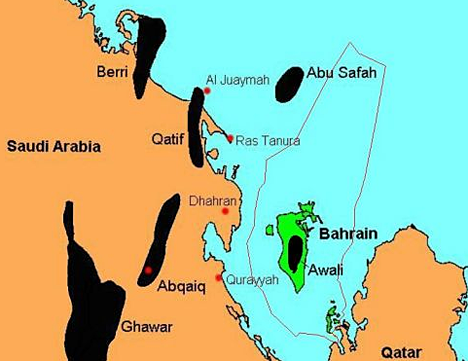 (Half the revenue from Abu Sa’fah goes to Bahrain as JoulesBurn has explained and that arrangement continues with Bahrain getting the revenue from 150 kbd of oil. In 2007 Aramco brought 500,000 bpd of Arabian Light onto the market through the Khursaniyah development. (this included the onshore Abu Hadriya, Harmaliyah, and Fadhili fields) though it first began production at a lower volume in 2008. The associated gas plant ran through some troubles and delays before coming on line in 2010, and this also delayed the time over which the field came up to full production. Down at the other end of Ghawar there are a group of oilfields found since 1967 including Hawtah and Nuayyim, in the Central Region. The group of fields, referred to as the Hawtah Trend or Najd Fields has had problems in the past with sand inflow into the wells, and there is some debate as to whether the reserves in the region total 10 billion or 30 billion barrels of light, sweet crude. Hawtah itself produces around 150 kbd, but the associated fields brought this up to 400 kbd. Nuayyim came on line with an additional 100 kbd in August 2009. Haradh has been discussed earlier as part of Ghawar, and the major addition that came that year was at Khurais, which added 1.2 mbd to supply potential. (Increase in production from Shaybah brought another 250 kbd to the total). Khurais, was mapped by JoulesBurn in 2008, and it was here that the need for additional drilling rigs became more evident in getting all the wells brought on line in time for the scheduled start of the upgrade. With that completed, the increase (which actually comes from the three adjacent fields of Khurais, Abu Jifan and Mazalij) of 1.2 mbd began production in June 2009. In terms of the production of the heavier oils that are taking a greater portion of the marketable Saudi product it has been suggested that KSA have planned to increase production at Zuluf, which has some 8 billion barrels in reserve, to a capacity of 1.2 mbd from 500 mbd (but with 200 mbd mothballed). Up on the Kuwaiti border lies the Hout oilfield, where work is now being developed to capture increasing volumes of natural gas now flared from the field. This is one of the four fields that the two countries share, and which includes Khafji, Lulu and Dorra. Most of the oil goes to Japan. Khafji came on line in 1960, and Hout in 1963. The fields have produced around 4 billion barrels of oil, and are now producing at around 610 kbd. Bids for the new development are now due in September. I will leave Shaybah and Manifa until next time. This blog is nice.ARMS Automation was formed with innovative ideas and relevant efforts in upgradation of technologies. Arms Automation is located at Bangalore, the machine tool hub of India.Hydraulic steady rest.